We are tractor experts. Hydraulic & Power Steering. Clutch, Transmission & PTO. Front Axle & Steering. Sheet Metal and Grille. Wheels, Hubs and Components. Seats and other Components. Rear Axle & Differential. 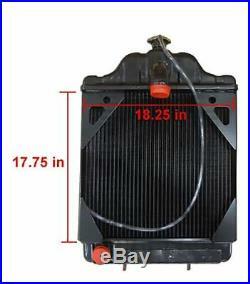 New Radiator For Case/International Harvester A39345, A35583, 530CK, 580B, 580CK. Gets you back in the field fast. Quality materials and craftsmanship match OEM specifications and fitment Typically priced 30 percent less than OEM produced components. Our radiator quickly cools fluid to keep your tractor running smoothly during planting, growing and harvest seasons. OEM Quality for Reliable Performance Quality construction keeps your tractor running for years of dependable service. Radiator is sourced from factories that partner with Complete Tractor in the design and manufacture of tractor components that meet OEM specifications. Seams are securely welded for sealed, leak-free operation. 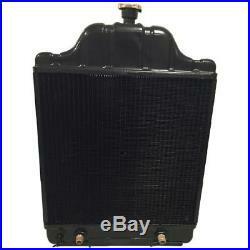 Oil Cooler Included This radiator comes with an oil cooler on the grill side. The oil cooler also aids in keeping the engine cooler. Because of the constant flow of oil throughout the engine, keeping motor oil cooler is very effective in keeping your engine cool. Specs: 3/8x 18 NPT, with cooler-motor side ports. Designed to Get You Back in the Field Quickly Complete unit comes with a pressure cap. Sturdy packaging ensures your radiator arrives protected from damage while in transit. This radiator is typically priced 30% less than OEM components without compromising quality because of our factory direct relationship. 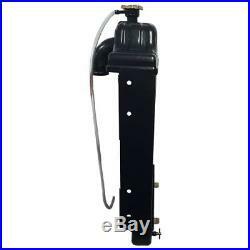 Description : Radiator Overall Height : 28 5/8″ Overall Width : 18 9/16″ Overall Thickness : 3 9/16″ Top Hose Connection Outside Diameter : 2″ Lower Hose Connection Outside Diameter : 1 3/4″ Core Height : 17 9/16″ Core Width : 18″ Core Thickness : 2″ Neck Height : 1 3/4″ Mounting Width Center to Center : 8 1/16″ Rows : 3 Fins per Inch : 8 Includes Pressure Cap : Included Product Notes : W/oil cooler on grill side: 3/8x 18 NPT, with cooler-motor side ports. Unless otherwise specified in the item listing on our website, on the receipt or packing slip, or in the following terms, Complete Tractor will accept qualified and conforming products for replacement for the period of 1 (one) year. Products must be in? Condition and free from damage of any type, including, but not limited to dents, scratches, cracks, abuse, defacement or indication of removed screws/fasteners or seals. Complete Tractor shall not be held liable for packages lost in transit. The customer may use this label to return the item to Complete Tractor free of charge. After the item is received by Complete Tractor for processing, Complete Tractor will send out a replacement unit. If you have a problem, we will take every step to assist you. View more great items. This listing is currently undergoing maintenance, we apologise for any inconvenience caused. 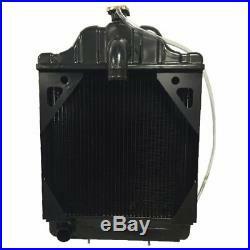 The item “New Radiator For Case/International Harvester A39345, A35583, 530CK, 580B, 580CK” is in sale since Tuesday, July 11, 2017. This item is in the category “Business & Industrial\Heavy Equipment, Parts & Attachments\Heavy Equipment Parts & Accessories\Tractor Parts”. The seller is “completetractor” and is located in AR, CA, FL, IA, MA, MI, MN, OH, PA, TN. This item can be shipped worldwide. This entry was posted in radiator and tagged 530ck, 580b, 580ck, a35583, a39345, caseinternational, harvester, radiator. Bookmark the permalink.